Learn who we are by what we do! Learn About Our Club and Find Us in Action! 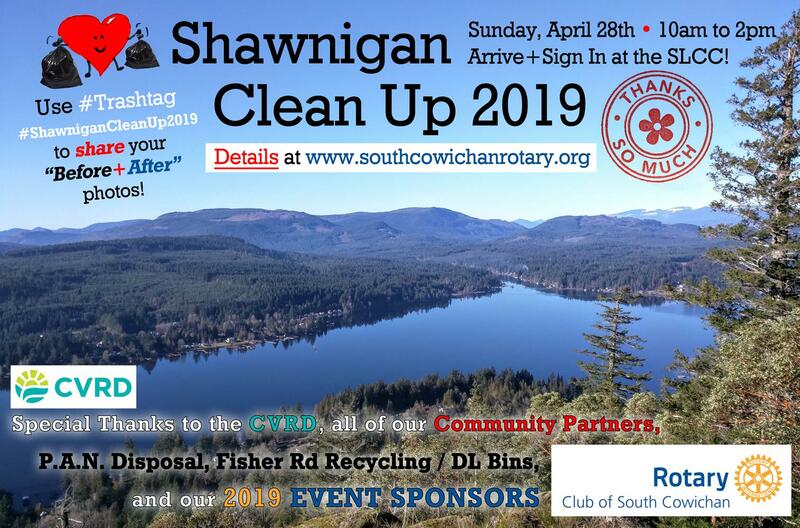 Mark your calendar and watch for *updates* as we add MORE litter-be-gone FUN for our 2nd Annual Shawnigan Clean Up Event! Take Note of our New Location as of March 2019! Have you REGISTERED yet for the District Training Conference? 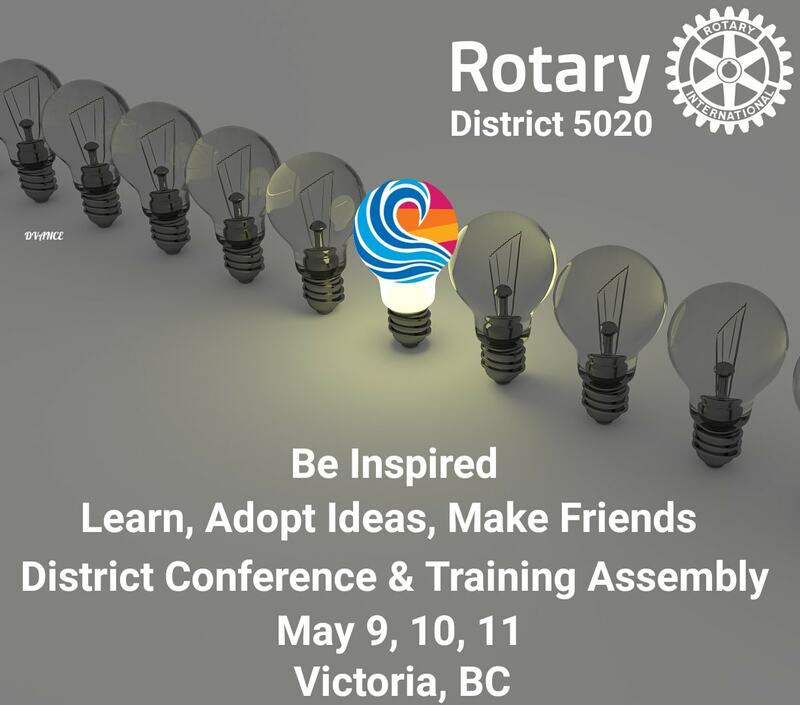 BE INSPIRED by the Speakers, Trainers and fellow Rotarians! Getting Hoppy in Mill Bay! Mark Your Calendars for Saturday, April 20th! 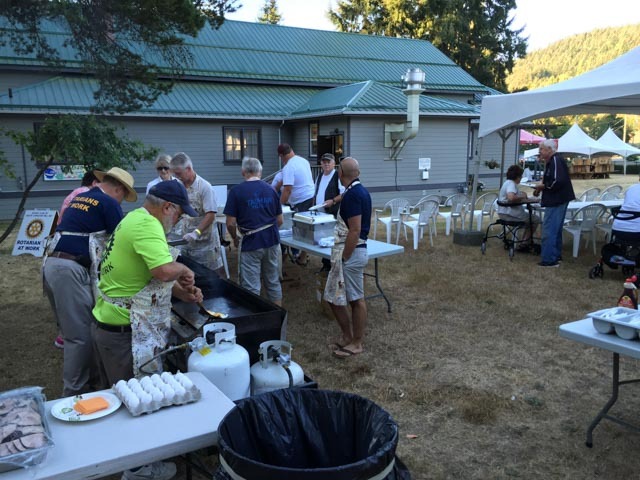 Rotary Cook Cart in Action! Look for us to feed you at Seedy Saturday in Cobble Hill on March 9th from 10-2! The Rotary Rabble Rousers "Bowl for Kids' Sake"! Photographic proof we were Great Sports at 10pin Bowling '80s-style on Sunday March 3rd! 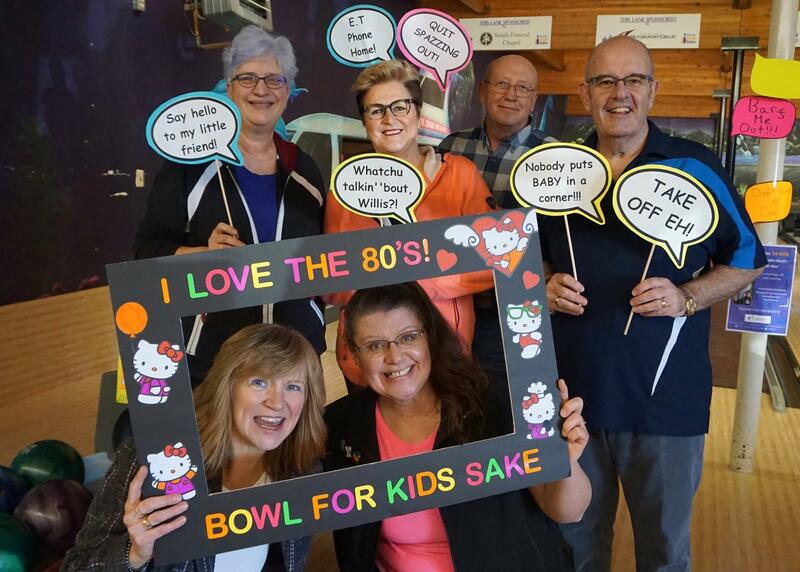 Each bowler registered a minimum $50 pledge to benefit the Big Brothers Big Sisters of the Cowichan Valley mentoring program! See below (or click here) for more info about the annual event at the BBBS Facebook page! Pictured here are Shirley, Marja, Roman, Tony, and Sarah & Kim having a ball! Many thanks to our Team Captain Gay who missed out on her share of the gutter balls this time! 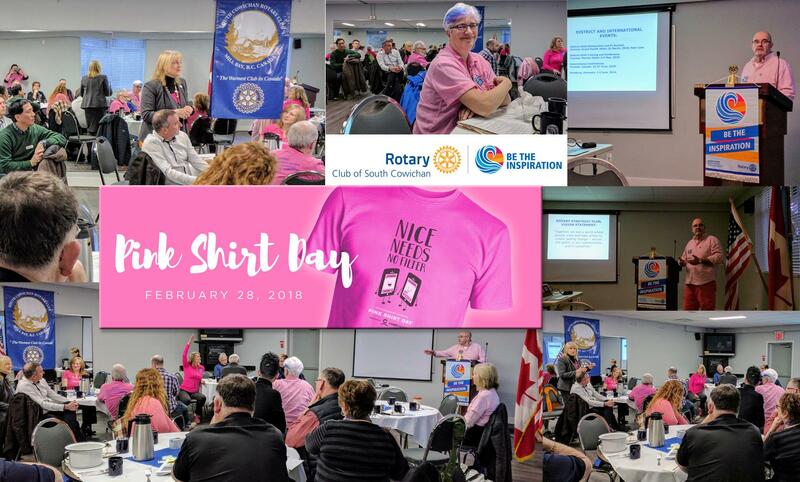 We support Pink Shirt Day 2019! Our President Elects from Area 5, all primed to plan their upcoming year as Rotary Presidents! From the left: Richard Calverley, Chemainus; Sandra Milne, Ladysmith; Gerry Giles, South Cowichan; Gay Wise, Assistant Governor; Doreen White, Duncan Daybreak; Mike Taylor, Duncan; missing is Chris Cheeseman from Salt Spring Island who will be serving a second term as President. We were an attentive audience being schooled in nature-based learning this morning! Plus it was wonderful to welcome back a few friends we hadn't seen in a while. We enjoyed a time of warm fellowship inspired by great speakers! 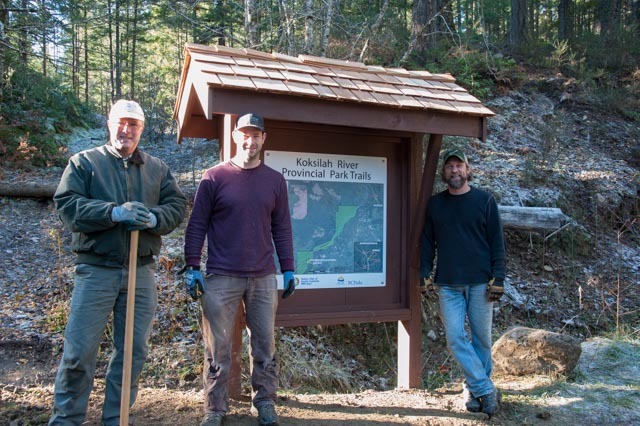 Club member Ron Linkes and his team are busy crafting more of these "Little Libraries" to install in our communities here in South Cowichan! The club is expecting donations of all sorts of books and family-friendly reading material. Yes, kids books are very welcome too! Let us know if you'd like a box in your neighbourhood to keep the mailboxes company and foster your literary adventures! Ron tells us, "Our second cluster of community libraries are currently going up. The snow has stopped us from planting the last three but they will be in place as soon as weather permits. We will soon have thirteen libraries scattered throughout the south valley and I have to say they have been well used. There is a good rotation of books circulating through each location and problems of vandalism and maintenance have been minimal. In two years we have only lost one to a fire. With the Rotary logo and email address posted on each box it is a great way to advertise the club in the very neighbourhoods our future members are likely to come from. We have even received requests to install a library in certain locations which can only be a good thing. If you have a location where one of our libraries would work now is the time to let me know. We are down to two that still do not have a home." ---> Ron can be reached by email at this link. 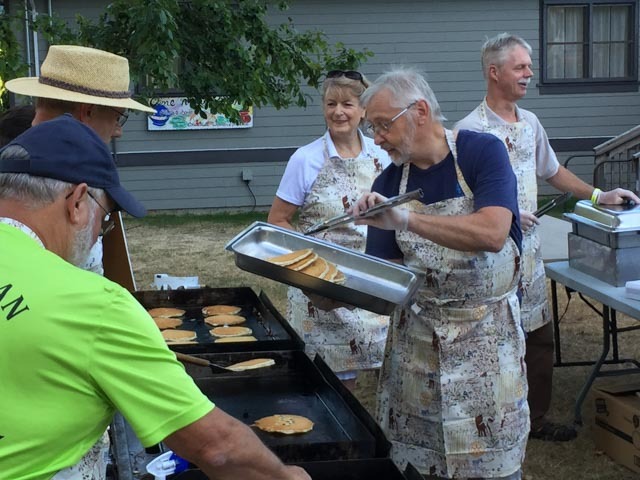 Community Cook Cart Fundraiser a Sweet Success! Teaming Up to Build a Peaceful Garden...🌻 Rotary Assistant District Governor Gay Wise is very proud that all of the Rotary Clubs in the Valley have stepped up to ensure that the natural environment around the Hospice will be one of peace and serenity. Check out the photos! Click here to go to the story on our Facebook Page! Our photo gallery is on our Facebook page! 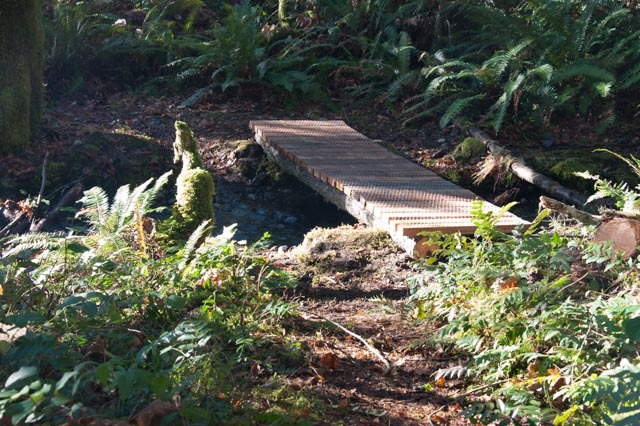 For more information please visit the Mill Bay & District Conservation Society website! A Very Merry Breakfast Meeting! Please find all of the above photos on our club's Facebook page! What a magnificent occasion, a real buzz of energy. 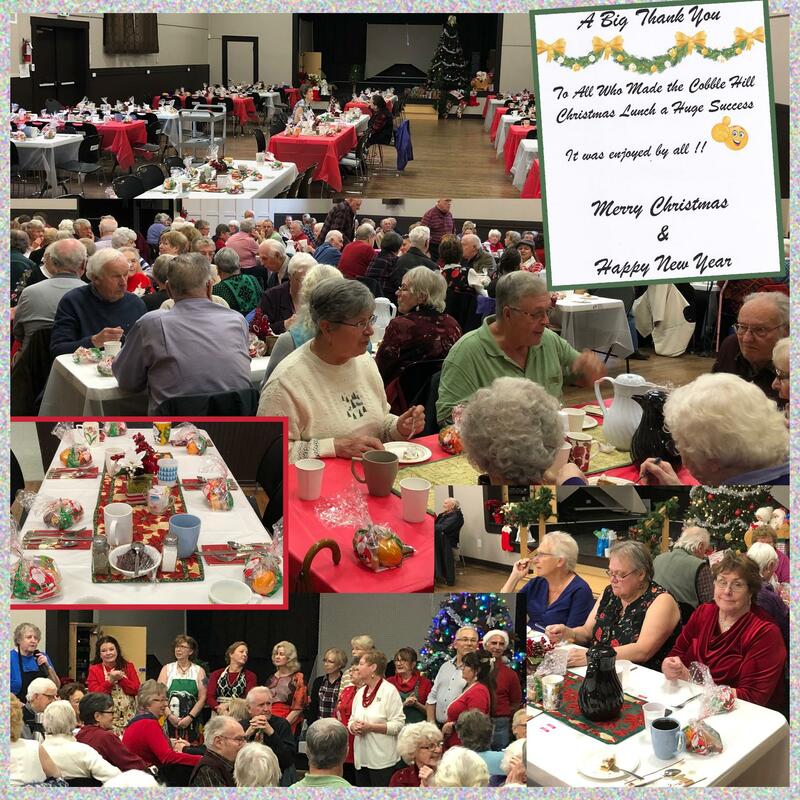 The 7th Annual Seniors Lunch was held at Cobble Hill Hall on 17th December. In total some 240 traditional turkey lunches were served including 40+ volunteers, without whom this event could not take place. 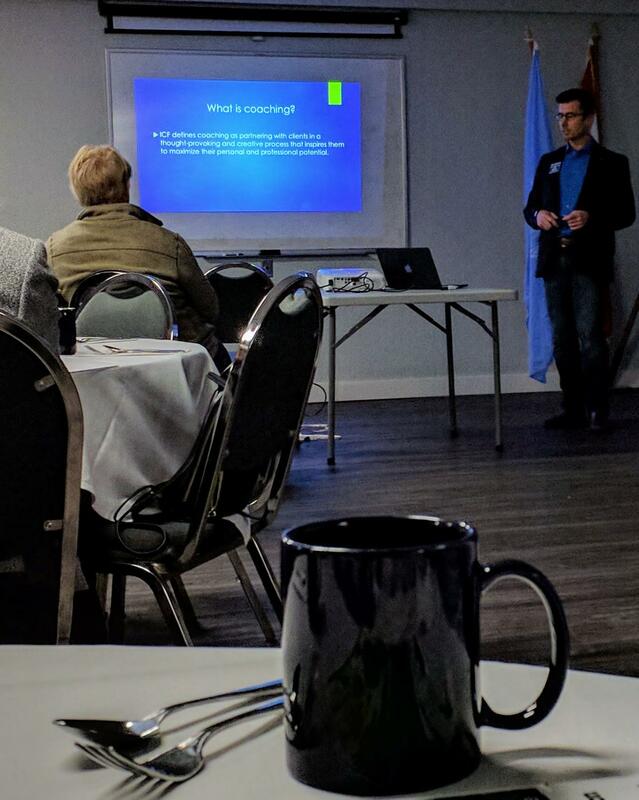 Several of our club members were spotted in action! The hall had been beautifully decked out with Christmas decorations and treats. Along with the meal, a raffle was undertaken so many of the Seniors went home with an early gift from Santa and a big smile. Our thanks go out to all the volunteers for the hard work and effort they put in. And it’s not just at Christmas. The volunteers turnout throughout the year staging senior lunches on the second and fourth Mondays of the month, with seniors gathering around 11:45 am. The recommended donation for the meal is $6. So if you are not already attending come along and join the fun! Thanks also to the Farmer’s Institute who give the hall free of charge and a special thanks to our very own Gerry Giles the mastermind behind all the lunches. Enjoy the holidays and wishing you a fabulous 2019! Our Rotary Foundation Chair and Director of Fund Development Roger was kept busy giving out Paul Harris pins at our annual Christmas Brunch! Congratulations to this year's contributors, including those not pictured here. We are inspired by your Service Above Self! 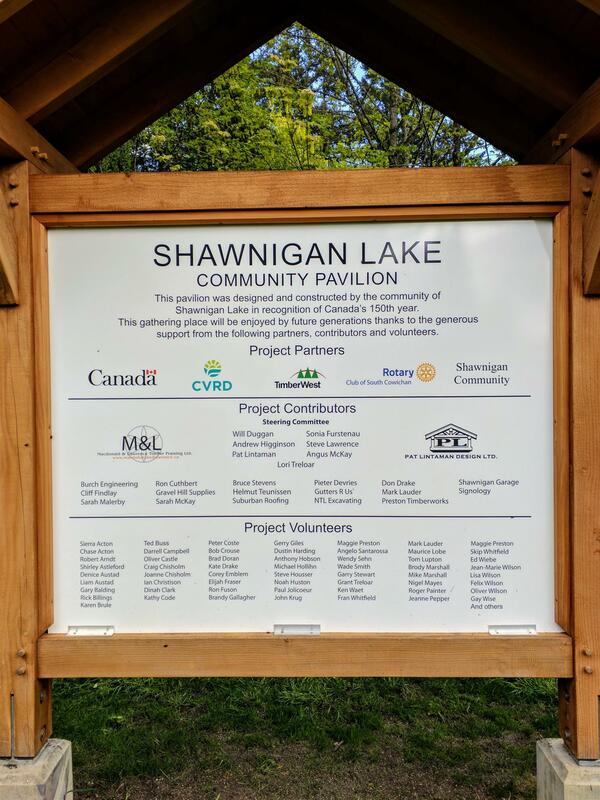 With special thanks to Frank Simpson and his crew of volunteers from our community and club! Available in November and December for $15.00 per bag - a way to brighten someone's day! Thank you to Rotarian Marja Tencate and participating club members! Sold Out Event - Thanks Everyone! Thank you Tony, Sarah and Jaap Swaan of RCMSR34 and his team!!! 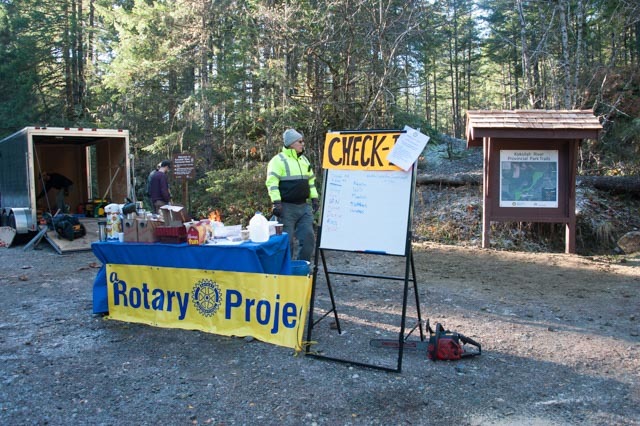 A combined total of $13,000 was raised, to be shared between the Rotary club and the RCM Search and Rescue group, for upcoming projects! On October 10th we had a visit from Jayne Shaw of Victoria's Quilts Canada and learned how talented volunteers are compassionately giving to those going through cancer treatments, and we were encouraged to share this resource with anyone we knew who could benefit. Donations to support this cause are welcomed on an ongoing basis through their website. In October we also received a visit from Rob Hutchins and Gretchen Hartley of Cowichan Hospice with some exciting news! Rob gave an overview of the new hospice planned to be built next year at Cairnsmore Street, along with the plan for a garden to be funded (if it goes ahead) by the Rotary clubs of Duncan and South Cowichan at a cost of $390,000. This garden project which will not take place until the new 10 bed hospice is built, so we look forward to assisting with the grounds in the next few years. Fundraising will be the first step! 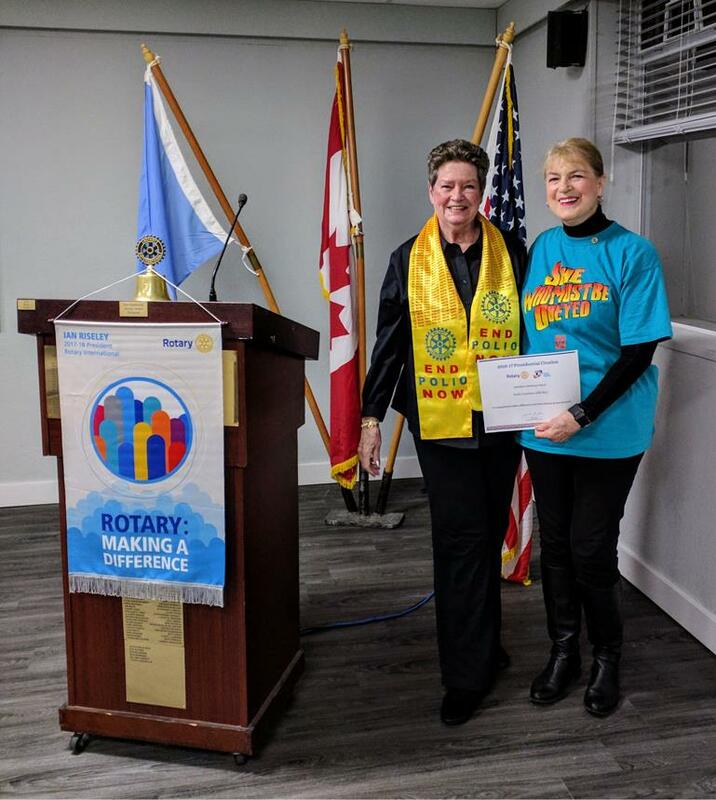 On Wednesday the 24th we held a special evening event together with the Chemainus Rotary club at the Cobble Hill Hall to raise funds for World Polio Day! We were especially thankful to have Joan Firkins visit us as our Guest Speaker. Thanks to all who participated and especially to our tireless organizers and cooks! See below for more details! 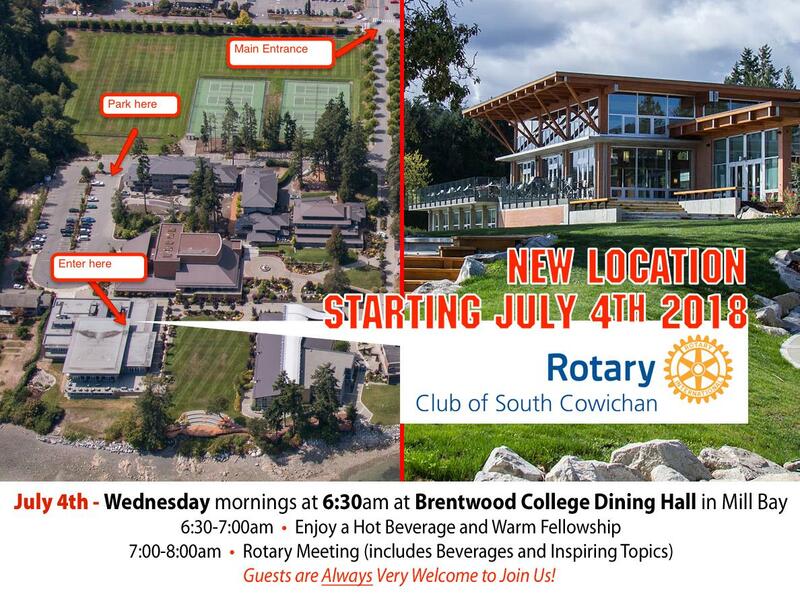 Thank you and consider this your invitation to join us at our breakfast meetings on Wednesdays at 6:30am at the Brentwood College Dining Hall to learn more about Rotary and what we do! 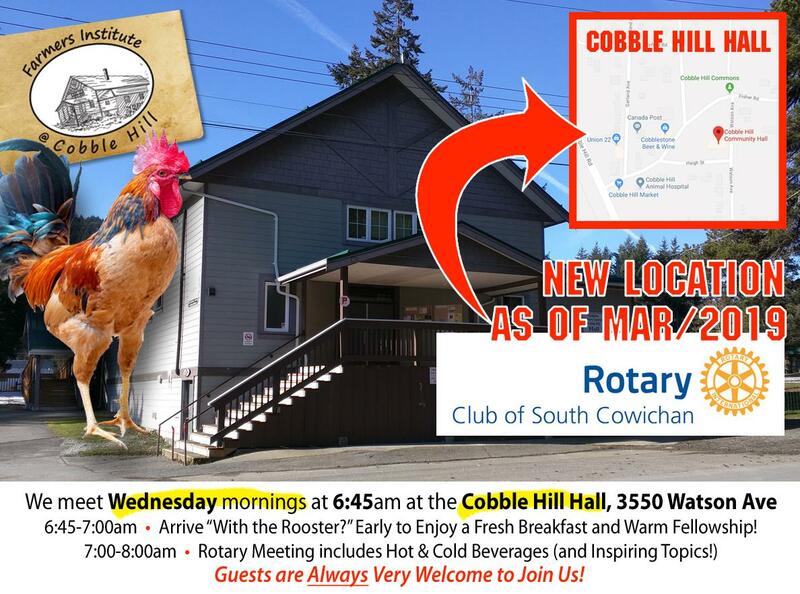 Thank you and consider this your invitation to join us at our next meeting of the Cowichan Valley Rotary clubs which will be a special morning Breakfast with Guest Speaker District Governor Craig Gillis at the Cowichan Golf & Country Club at 7am on Friday, September 28th! In the world of charitable giving there are “transformative gifts”. Basically, gifts so large they transform the recipient organization. Say for example, a $20-million gift to a small college that enables it to build a whole new science wing. But there are also smaller gifts that can have a huge impact. 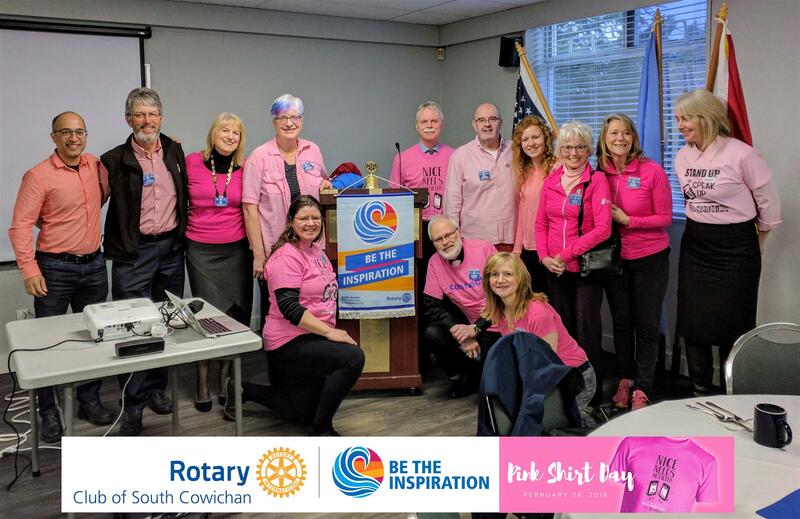 Example: in 2015 the South Cowichan Rotary Club Foundation gave Cowichan Hospice $5,000 in seed money to help the Society move forward on its dream of a stand-alone 10-bed hospice house for the Cowichan region. Cowichan Hospice has done an amazing job providing counselling and support for people in their final stage of life, and their families. But it has never had actual hospice beds, so many people have had to spend their final days in a hospital ward. Not great for the dying patient, nor their families. Cowichan Hospice is determined to change that. Island Health has agreed to fund the operating costs for a new hospice facility, but the Society must come up with the money for construction. 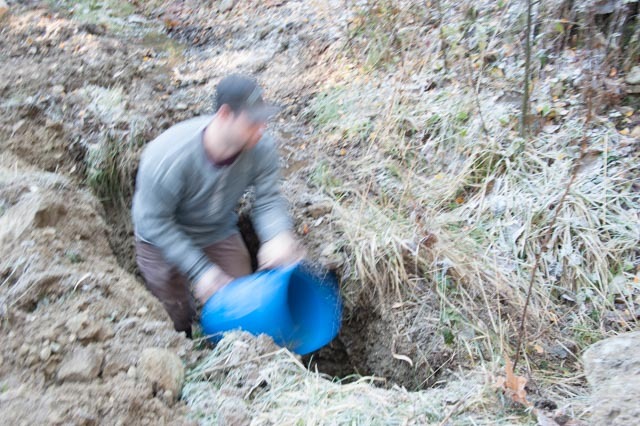 No small task for a small, lean, volunteer organization. 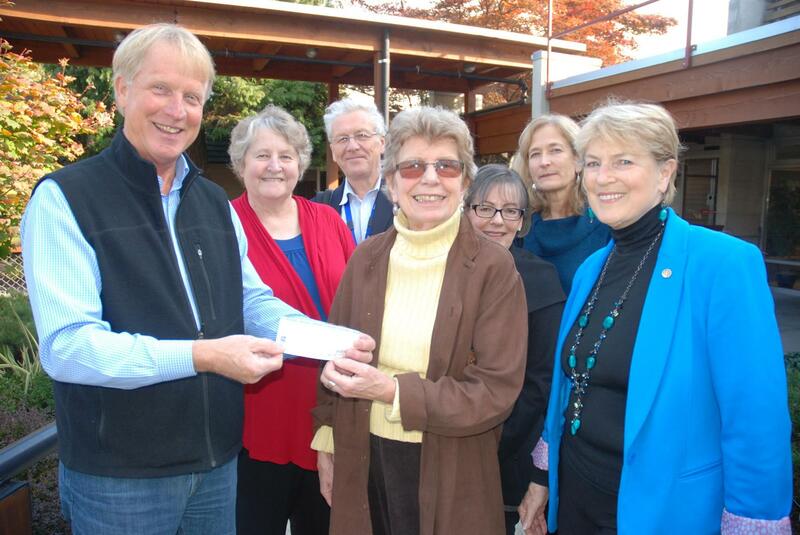 The Hospice Society approached the South Cowichan Rotary Club Foundation for help. 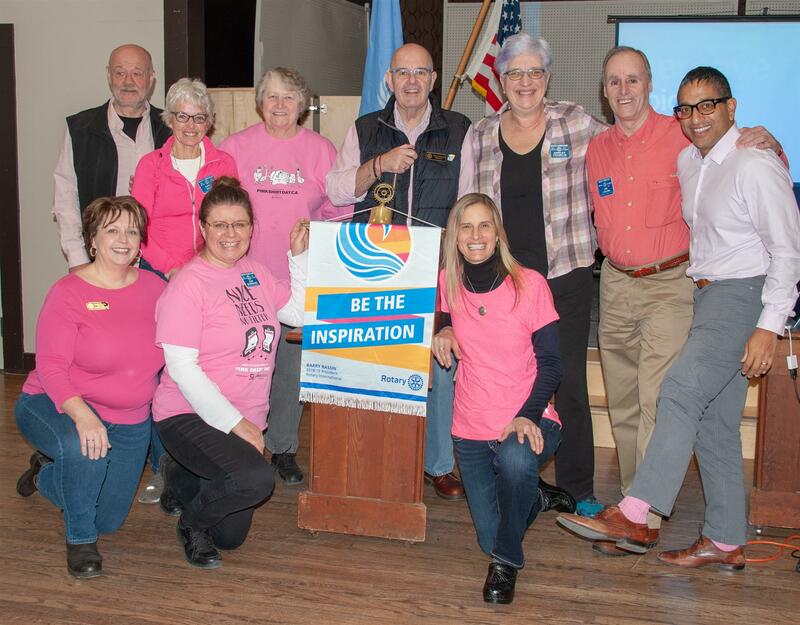 The Rotary Club and its Foundation have always supported Hospice care programs, but this was a new request: seed money to pay for the first steps leading toward a significant fundraising campaign. 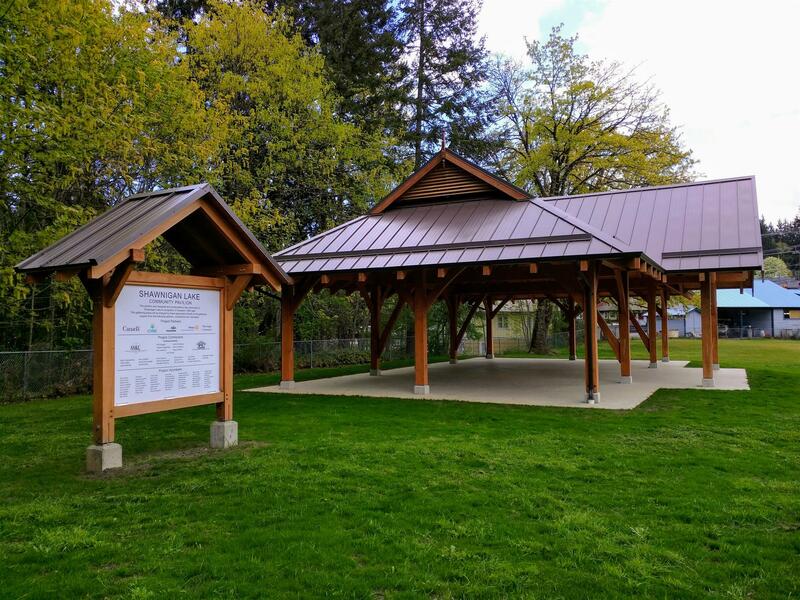 The South Cowichan Rotary Club Foundation made what for it was a ‘stretch’ contribution of $5,000. This went toward an initial site selection study, development of a functional program as the basis for design and generating publicity material highlighting the need for a hospice house. Fast forward three years from that first gift in 2015. Cowichan Hospice has forged ahead raising several million dollars – even before the “official” fundraising campaign begins. It is coming ever closer to making hospice beds available in the Cowichan Valley. 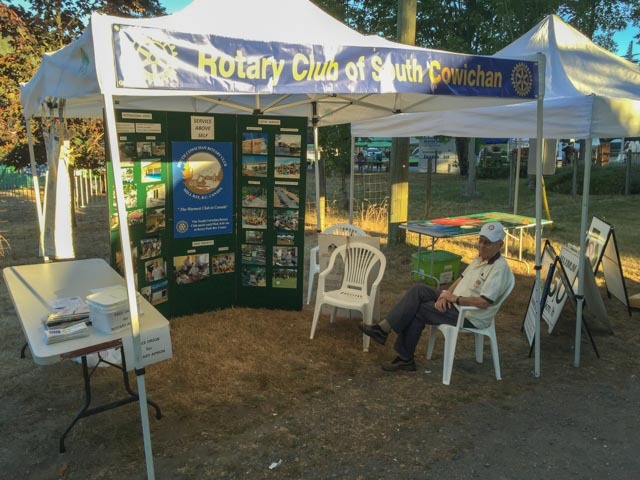 In the kind words of Cowichan Hospice House chair, Christa Fox, “It all started with that one gift from The South Cowichan Rotary Foundation”. So, you never really know the potential power of a strategic seed gift. 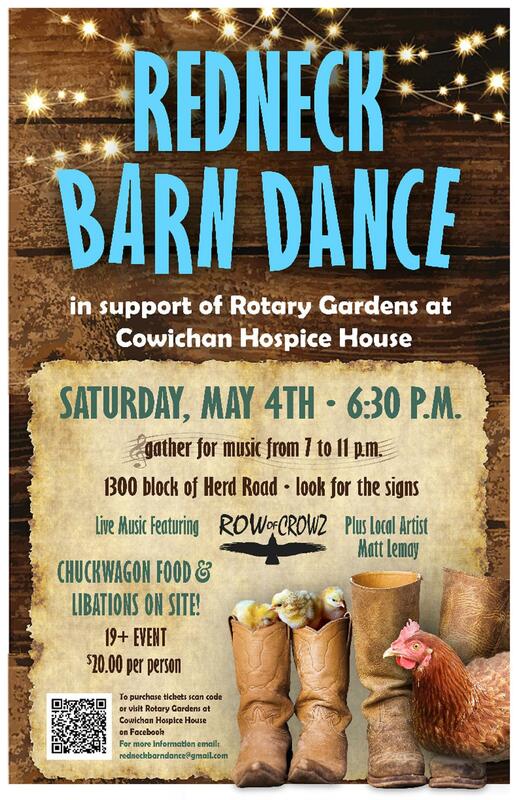 Bravo to Cowichan Hospice for making that seed money blossom and helping the dream of hospice beds in Cowichan Valley become reality by 2020. There is still more work to do. More funds to raise. 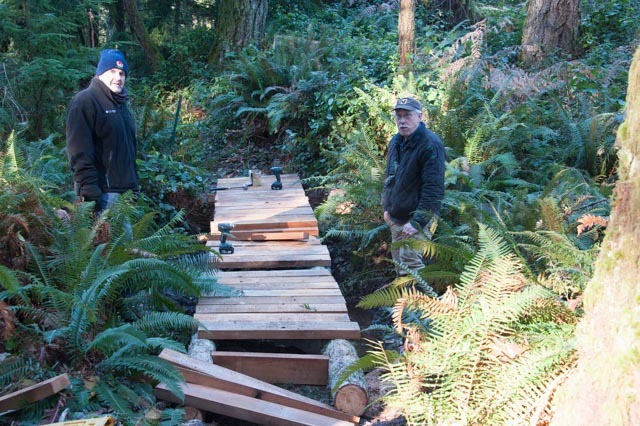 But it is such a worthy project, I hope all good people of Cowichan Valley will jump on board. Rotarians know how to make COMMUNITY SERVICE FUN! Huge thanks to everyone who participated in these events and were with us in spirit! Find the full Golf Tournament Photo Album on our Facebook page! Click HERE for the Cobble Hill Fair 2018 photo album! We have exciting news... we have MOVED! 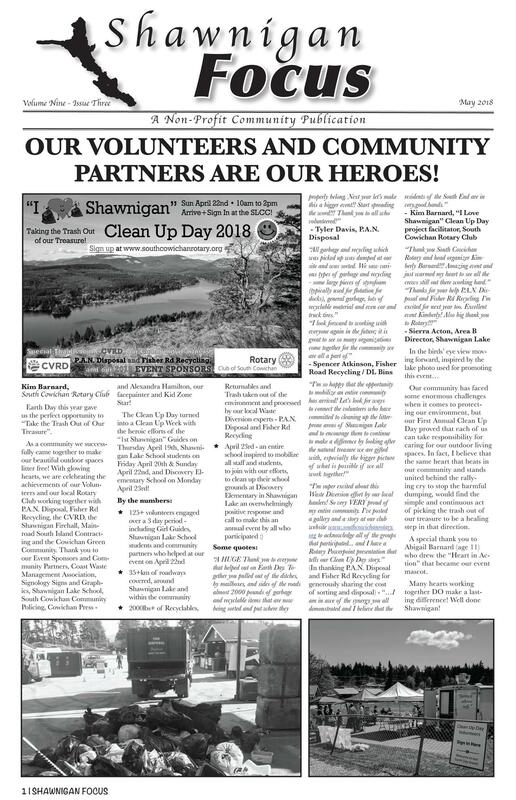 Shawnigan Clean Up Day in the News! Club Member Will Duggan is one of the Island's Top 20 Under 40! 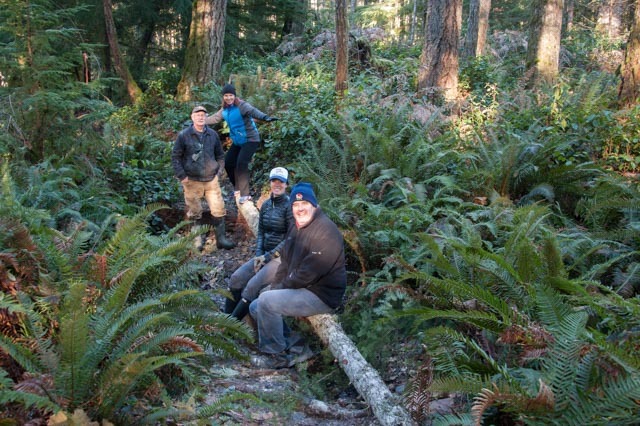 "For the sixth consecutive year, Roger McKinnon and a group of business and municipal leaders have beaten the bushes of Vancouver Island to find the best and brightest young entrepreneurs. There never seems to be a shortage, which leaves McKinnon and an a cast of judges from up and down the Island with the enviable task of whittling from an impressive list the 20 who receive the Top 20 Under 40 Business and Community Achievement Awards. This year, 111 nominations were considered. McKinnon said winners are no longer selected only for their business successes, but half the merit in their selection is how they give back to their communities, either through charitable work, contributions or through programs they have developed through their businesses." Congratulations Will Duggan, from all of us! 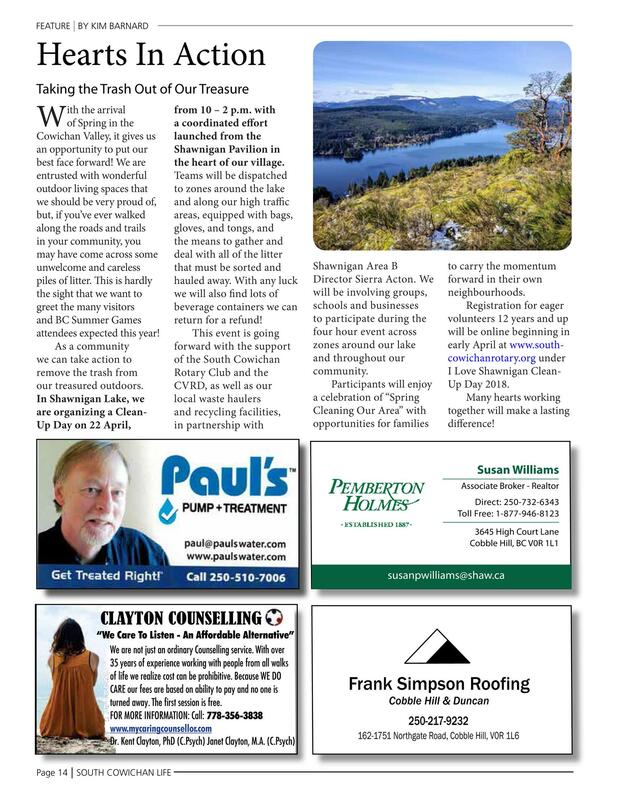 Happy Earth Day, Shawnigan Lake! Thank you to EVERYONE who made this event possible!!! Our Community Partners are Heroes! More photos and the final numbers on how much litter we collected will be shared soon! Please view our Photo Gallery here - and you can send photos and/or stories to Kim at kim.barnard@gmail.com to be included! 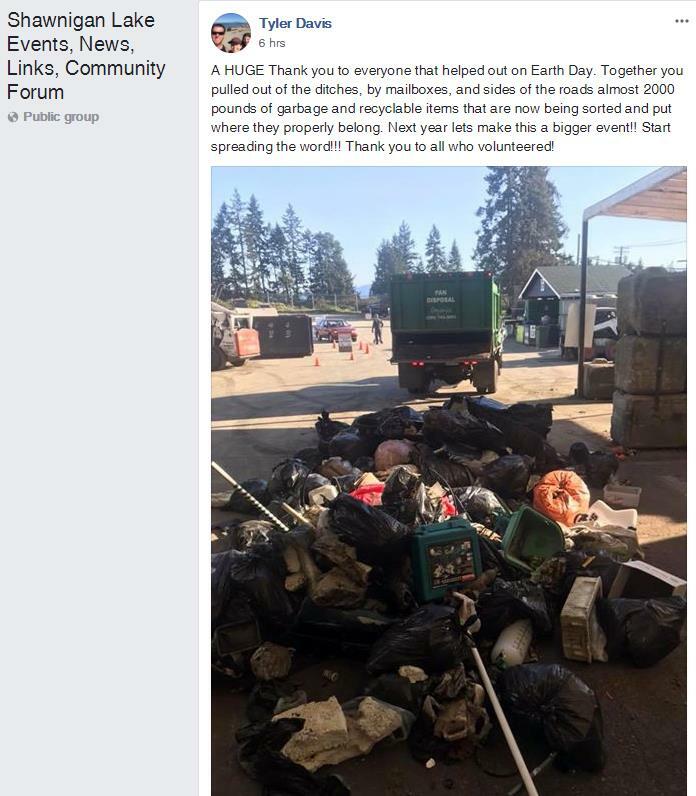 On Sunday, April 15th, members of South Cowichan Rotary Club worked side by side with the Frances Kelsey Secondary School (FKSS) Youth Interact students on the group's annual Highway Clean-Up project in Mill Bay - collecting litter up and down the highway. After 2 hours of combing the roadsides for "all kinds of not-so-ducky debris", we were ready for a Tim Horton's treat! Thank you to everyone who was there and with us in spirit! Gerry Giles on behalf of the Seedy Saturday organizers thanked the Club members who were able to join them at Cobble Hill's Seedy Saturday Chuck Wagon event. Below are a few photos of the day. 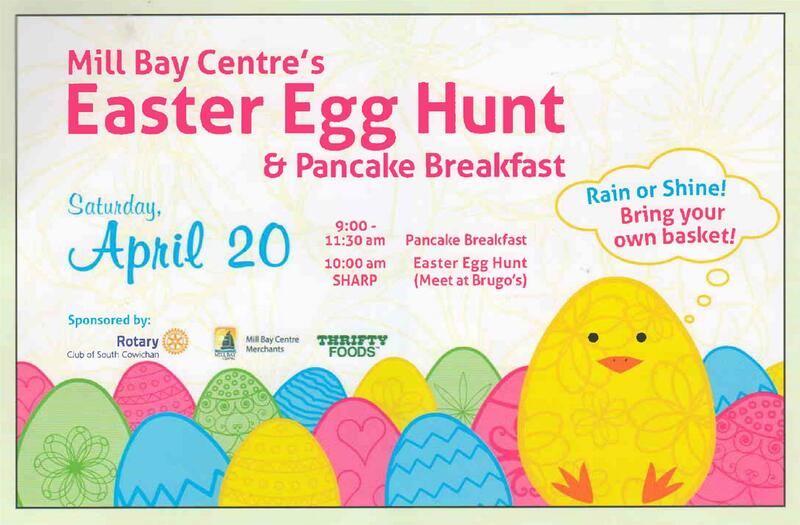 Next event for the Chuck Wagon is the Easter Egg Hunt held on Saturday, March 31st at Mill Bay Centre. "Thanks again to those who were there both physically and in spirit!" 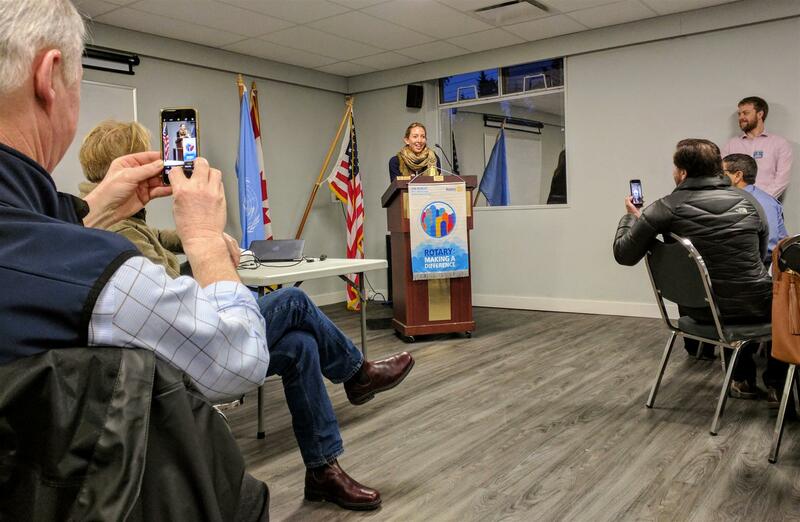 Rotarian Deryk Norton wrote to our club to give us this update on the Tambores por la Paz / Drums for Peace music project that began in July 2016 in Colombia . . .
Project expenditures for the first semester were very close to 25% of the budget, consistent with the semester being 25% of the project’s duration. Curriculum development and classroom delivery have used teachers with expertise in the subjects. Activities are carried out through experiential workshops. Sessions are also supported by volunteers. Wearing Pink on February 28th! sharing embarrassing information or threats. - because we know that Nice Needs No Filter!" Our Breakfast Meeting Speakers Enjoy an Attentive Audience! "Congratulations to Gay Wise, her executive and the Club for achieving a Presidential Citation for the 2016-17 Rotary year. 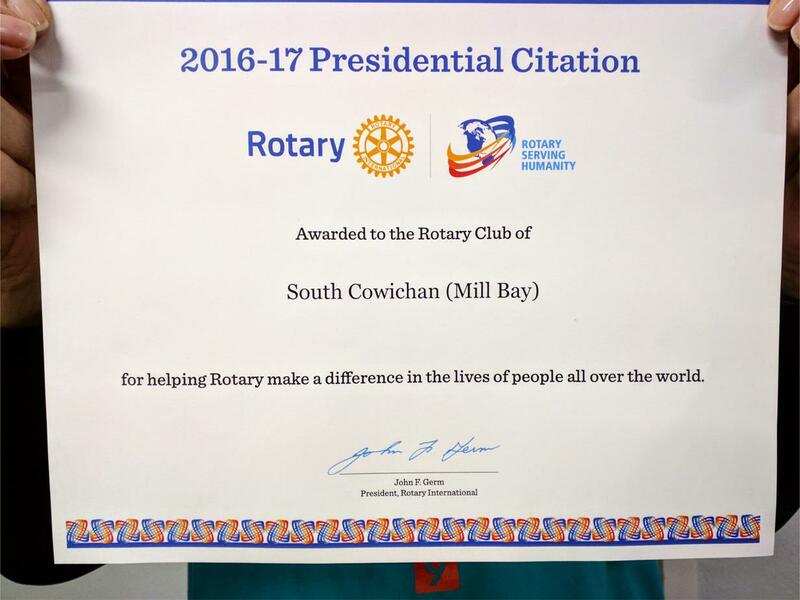 A Presidential Citation acknowledges the Club and all concerned for their excellent contribution to Rotary and to humanity. Great work everyone!" 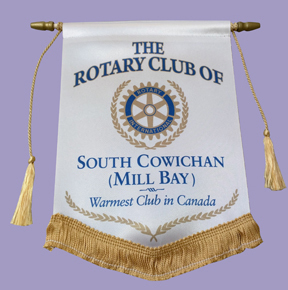 Each year, South Cowichan Rotarians assist the MS Society and help out with fundraising efforts. Pictured here, Rotarian Sarah Jackson volunteering her time. 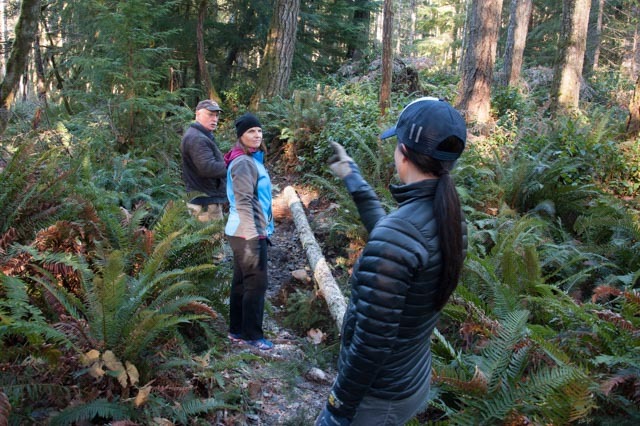 It was a cold day but that didn't stop Rotarians from showing up to help build bridges, erect signs and clean up the trail. 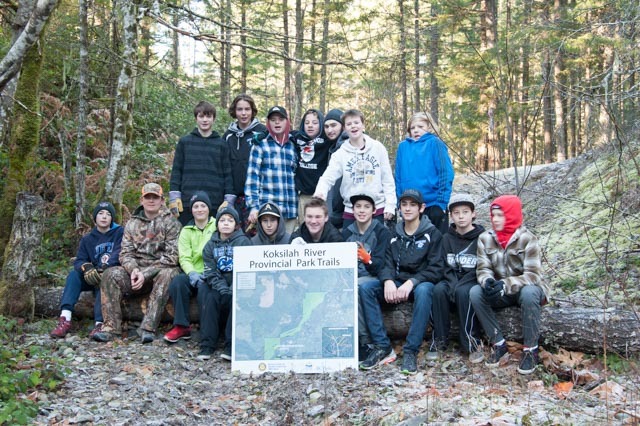 A special thanks to Tom Shadlock's hockey team for helping to carry the boards out to the bridge sites. You.. boys... not there, over here, wait no back there..no right here. I'm going as fast as I can! What bridge? Let them cross this log. Nice sign! Hey, who ate all the timbits? 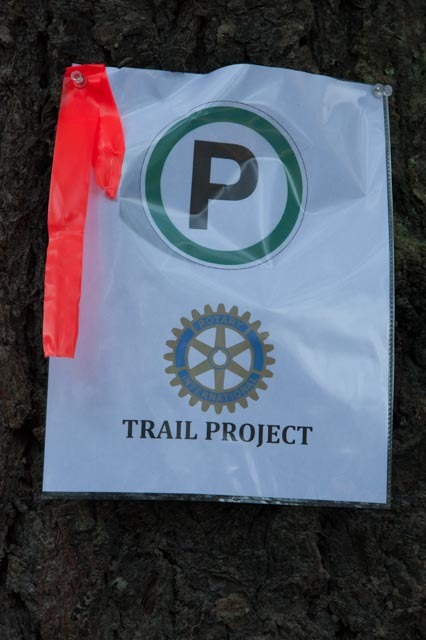 The 'Rotary Route' is a cycle touring route of Southern Vancouver Island . 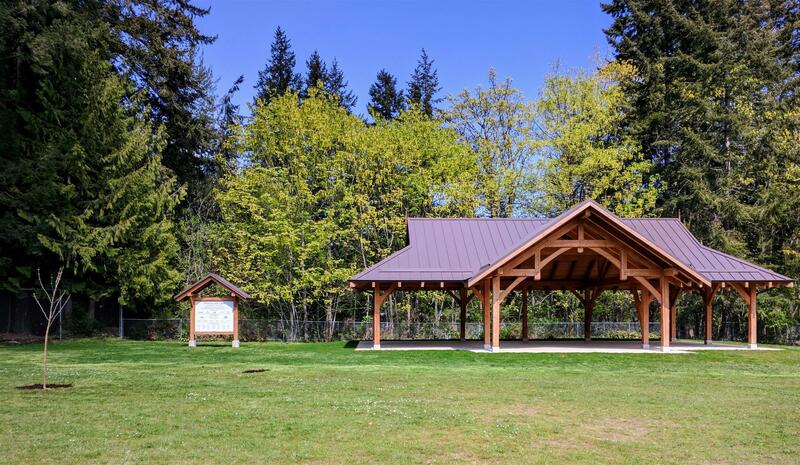 This carefully laid out route takes you through some of the Island's most scenic towns and countryside including Sidney, the Saanich Peninsula near Victoria, Mill Bay, Duncan, the Cowichan Valley, Chemainus, Ladysmith and the Cedar area south of Nanaimo. It also incorporates three beautiful ferry rides from Tsawwassen to Swartz Bay , Brentwood Bay to Mill Bay and Duke Point back to Tsawwassen. The route involves a total of approximately 110 kms of ocean travel by ferry and 110 kms. of cycling. 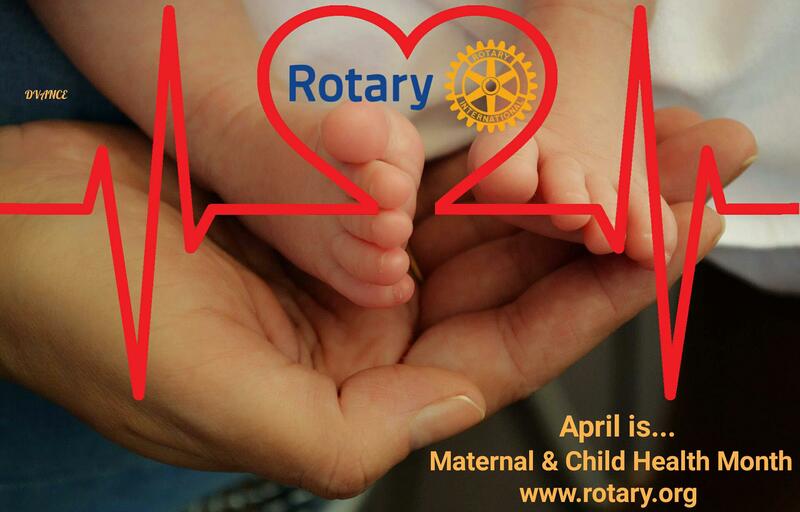 Want to make a donation to the Rotary Foundation? 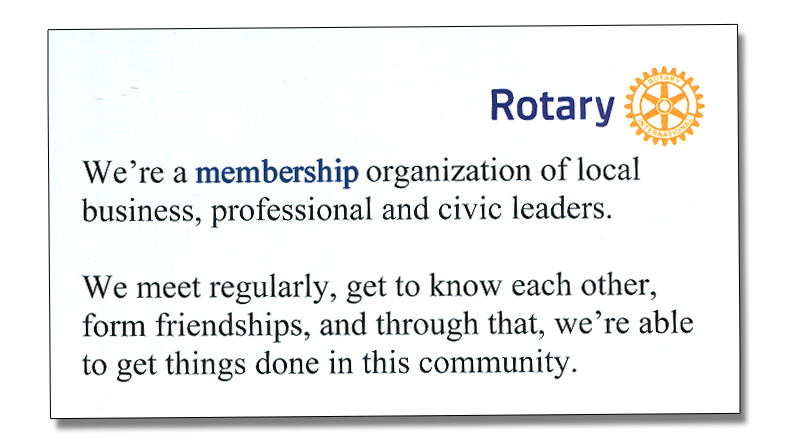 You can do that each week at our meeting, or you can go to rotary.org and click on "MyRotary".